"Despacito" was made available for digital download on January 13, 2017 by Universal Music Latin. It was released physically on April 30, 2017 in Europe as a 2-track single including the original and pop version. Some music publications believed the single's success was influenced by a trend of combining Latin pop and urban music after the release of singles by Nicky Jam, Thalia, Enrique Iglesias, Carlos Vives, Ricky Martin and Shakira. Fonsi considered the trend to be "the new pop", and Ender said of it, "everyone is making this type of fusions." Luis Fonsi also stated that two weeks after the release of the song and its music video he started receiving calls from "people who normally don't call. People who only call when something different is going on." He got calls from Ricky Martin, Juan Luis Guerra, Marc Anthony and other artists telling him it was a "home run." In the United States, the single debuted at number two on Billboard's multi-metric Hot Latin Songs chart on February 4, 2017, becoming Fonsi's highest-charting single since June 13, 2009, when "Aquí Estoy Yo" peaked at the top position. 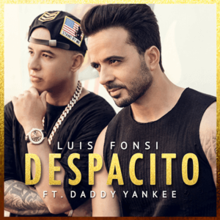 "Despacito" also became Fonsi's and Daddy Yankee's first number-one single on the US Latin Digital Songs chart after selling 11,000 downloads on the week ending February 4, 2017. It was Daddy Yankee's highest debut ever on the Hot Latin Songs chart, in which he marked his 48th career entry. "Despacito" reached number one on the US Hot Latin Songs chart on February 18, 2017 and remained there for 35 consecutive weeks until October 14, 2017. In 2018, it returned to number one in three different runs for 17 consecutive weeks from January 6 to April 28 and for other four non-consecutive weeks between August 4 and September 1, totaling 56 non-consecutive weeks. It is the longest-reigning number-one on the Hot Latin Songs chart, surpassing the 41 weeks of "Bailando" by Enrique Iglesias featuring Descemer Bueno and Gente de Zona, achieved between May 2014 to February 2015, on the issue dated February 17, 2018. "Despacito" left the Hot Latin Songs chart on March 9, 2019 after 110 consecutive weeks, becoming the list's second longest-charting title, due to a recurrent rule that removes songs that rank below number five after 52 weeks. The track has never ranked below the top five of Hot Latin Songs during the entirety of its run. After falling to recurrent status, "Despacito" has topped the Hot Latin Songs Recurrents chart for seven weeks since the issue dated March 9, 2019. It has also topped the US Latin Digital Songs and Latin Streaming Songs charts for 69 and 59 non-consecutive weeks, respectively, and is the second longest-running number-one on both lists. On the US Billboard Hot 100 chart, the single debuted at number 88 on February 4, 2017, becoming Fonsi's third entry on that chart and Daddy Yankee's seventh. It subsequently peaked at number 44 on April 15, 2017 before the release of the remix version featuring Justin Bieber. Four weeks after the remix's release, "Despacito" reached number one on the Hot 100 for the week ending May 27, 2017, becoming both Fonsi and Daddy Yankee's first number one on the chart, and Bieber's fifth. It has topped the Hot 100 for 16 consecutive weeks, tying with "One Sweet Day" by Mariah Carey and Boyz II Men as the longest-leading number-one single in the chart's history. It also became the first mostly-Spanish-language song to lead the all-genre US Digital Songs chart after selling 86,000 downloads on the week ending May 13, 2017. On the issue dated July 22, 2017, it became the first non-primarily-English-language song to top the all-format Radio Songs and Mainstream Top 40 charts. On October 21, 2017, "Despacito" and "Mi Gente" by J Balvin and Willy William featuring Beyoncé marked the first time that two non-primarily-English-language songs chart within the top 10 of the Billboard Hot 100 simultaneously since the list's inception in August 1958. The song disappeared from the Hot 100 on the week ending January 27, 2018 after a chart run of 52 weeks due to a Billboard recurrent rule that removes titles that rank below position 25 after that number of weeks. It has topped the US Hot 100 Recurrents list for three weeks and has charted for 51 non-consecutive weeks from to January 27, 2018 to March 9, 2019. It also became the longest-reigning number-one on the US Digital Songs and Streaming Songs charts with 17 and 16 weeks, respectively.